Quaint costume necklace for country style and traditional attire. 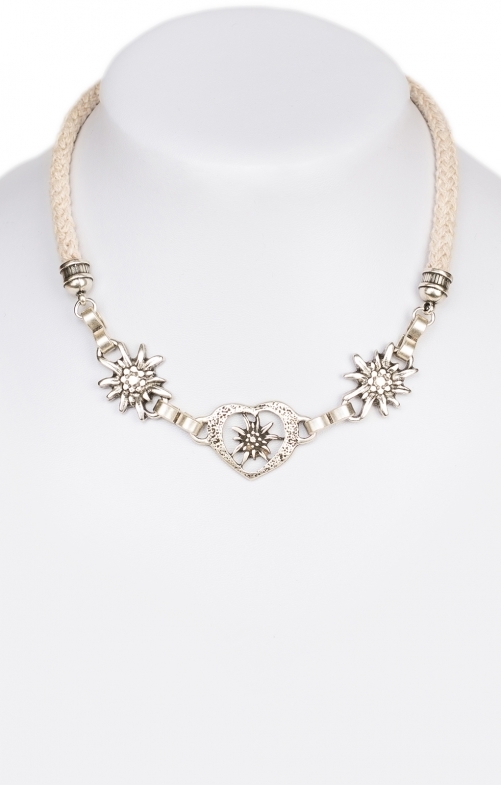 The necklace design Schuhmacher accessories, looks rustic and is ideal for the folklore fashion with your linen fabrics. The natural coloured cord chain is 4-5 cm adjustable in width. Fine chain links in antique silver look guarantee that the rhinestone-studded edelweiss and the edelweiss heart in front, fit perfectly to the body. Diese Kette gibt meinem Dirndl noch den richtigen Touch. Egal ob beim Altagsdirndl oder beim eleganten Dirndl. Hübsches Accessoires für mein Dirndl.